At The International Quilt Market in Houston last October, I met the darling Stephanie Kendron who is the founder and host of Modern Sewciety (a series of sewing/quilting related podcasts). 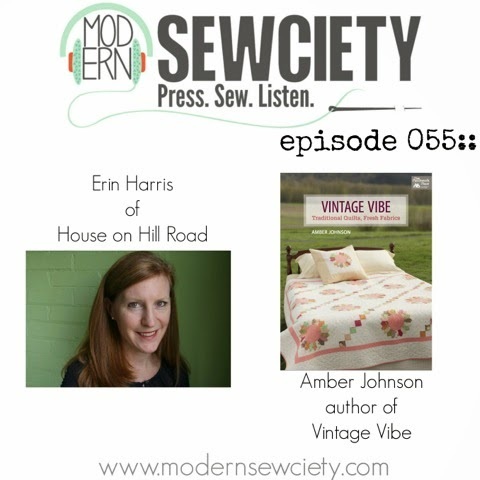 On Modern Sewciety, Stephanie chats with friends in the industry about all sorts of topics. Recently I enjoyed listening to her chat with "The Butlers" (as in Amy of Amy Butler fabrics and sewing patterns and David Butler of Parson Gray fabrics) who are so down-to-earth yet so inspiring! Our chat aired last Friday. We talked about how I got started in the industry, Market, the book, what I'm up to now... You can click HERE to listen. I'm relatively new to the podcast scene but am glad I found Modern Sewciety because I often find myself thinking it's too quiet when I sew! Do you listen or watch anything when you sew? Suggestions??? Be sure to stop by modernsewciety.com to enjoy all of Stephanie's podcasts! Yes, I listen to stories on CD's. I have some of my own, but mostly I get them from our local library. I've listened to some over and over again, but love a story in the background as I sew. Your book - Vintage Vibe - is still on my 'to buy' list. I definitely would like to make the 'Jar' quilt - soon! Beautiful work Amber, on all of the patterns. I listen to Modern Sewciety too. I love it. I'm like you, i sometimes think it's too quiet when I sew. I sew in the garage, so I like to have some noise. I am relatively new to podcasts too, but I jumped on the Serial bandwagon and have also been listening to Criminal. Oh and I was listening to you last night!